WE only grow hardy herbaceous plants available for sale. Most of the plants for here are produced on the nursery by traditional methods from plants displayed in the gardens. We are a selective growers, propagating only the plants which we believe to be hardy and garden worthy. Most plants hold the RHS Award of Garden Merit. 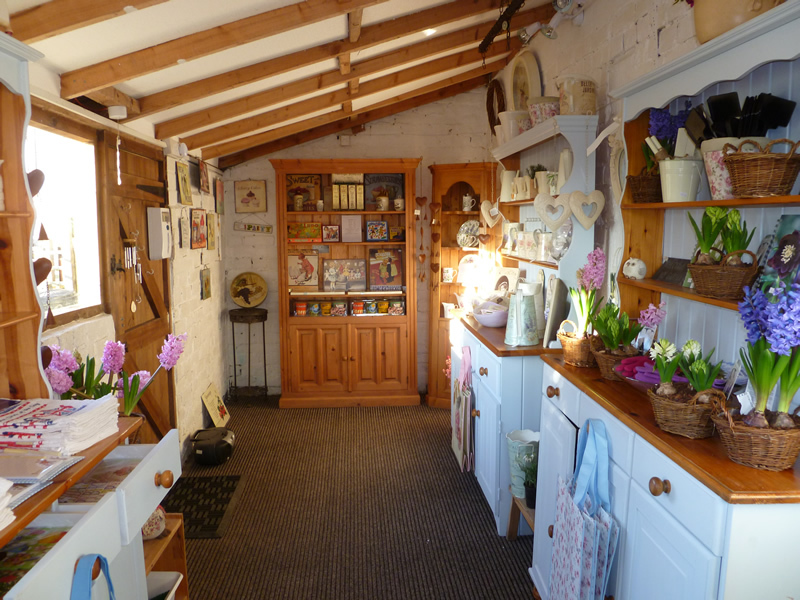 The nursery provides visitors with the chance to purchase plants they may have seen growing in the gardens and feel that they can’t live without! We can usually grow to order for you if we’ve sold out. BULBS are available March –Sept. ‘in the green’ lifted & potted by us during the cold winter months, all you have to do is collect them! None are from wild habitats. Bulbs include – winter, spring, summer & autumn flowering if you can’t see what you want, please ask. ALPINES for SUN or SHADE, GROUND COVER for SUN or SHADE. TALL, MEDIUM & LOW perennials for SUN, SHADE & DAMP SOIL. AQUATICS include moisture lovers displayed in our barrel ponds. SEASONAL – Plants that are in flower when you visit. 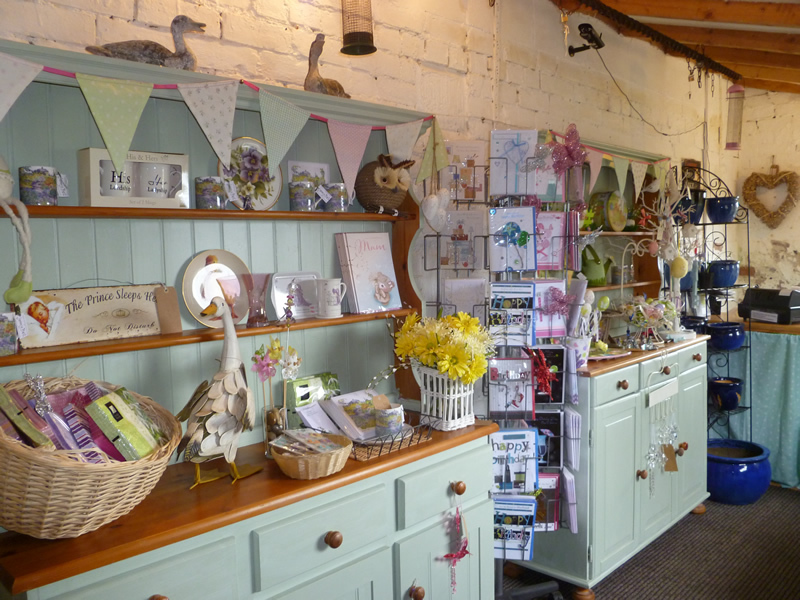 We have a small gift shop which offers a selection of garden and plant related, decorative, and useful items. We try to support local businesses, charities & artists each year. Quirky greetings cards & gifts by Alex Clark & Fine art animal drawings by Sarah Gee are very popular. We’re OPEN;- APRIL 3rd – MID Oct.
Open Good Friday, Easter Saturday, Sunday & Monday 11am-5pm. EASTER EGG TRAIL for school holidays is included in entrance fee. The coffee shop closes at 4.30pm each day. Child: aged 4-15 £2.00 includes an I spy trail around the gardens. NB. ADMISSION charges have remained the same for 6 years and are essential to help pay for maintenance of the gardens, thank you for your support. RHS Members Please check your handbook, Friday is RHS day. SEASON TICKETS Mar- Oct If you’re planning to visit the gardens more than twice this year, the season ticket will save you money. Adult/Senior single season tickets: £12.50 or Bring a friend (double) season ticket: £25.00 Weather permitting we try to add a few ‘extra’ days at the beginning and end of the season. These are also free to season ticket holders. SEASON TICKET RENEWALS SPECIAL OFFER -bring your key ring from last year and your replacement will be discounted to £12 or £23. SEASON TICKETS– grant unlimited access to the gardens, nursery & coffee shop during normal business hours.